- A Sri Lankan steel fitter injures his back. He is filled with hope. Learning of a little shrine dedicated to St. Jude in the mountains of his country, he hires people to carry him there, and soon he can go back to work. - Boris, a three year old canine boxer, vanishes on Christmas Eve while being shipped aboard a Delta jet from Florida to New York. His owner, was at the point of giving up all hope But he continued on. He carried out a devotion to St. Jude for several weeks. Six weeks later, the frightened dog was traced to an abandoned house. - In 1964, a navy chaplain was sent to Vietnam with 6000 marines. He lost his faith and was filled with doubt and unbelief. For two months he experienced darkness and emptiness. In a faint yet glimmer of hope, he prayed to St. Jude, came out of his "dark night of the soul", and regained his faith. The chaplain's name is Cardinal John O'Connor, leader of New York's 2.5 million Catholics. St. Jude is the symbol of hope; the patron saint of desperate causes. When you talk about Saint Jude, you talk about the world in despair because Jude is the last stop. That means, that when St. Jude becomes part of your devotional prayer life, you are reinforcing your desire to live and are refusing to be overcome by darkness. Who is this saint to whom more churches in the United States are dedicated than any other except for Mary? Who is this saint whose name is born by thousands of shrines and hospitals and to whom millions of petitions are addressed? What responsibility do we carry as a parish church which bears his name? This is the subject of today?s sermon as we celebrate the feast of St. Jude. The name Jude, comes from the Hebrew word meaning, "I will praise the Lord." There is little description of Jude in the bible. Jude is listed in the gospel of Luke as the son of James and as being one of the twelve apostles. Jude is not the same person as Judas Iscariot, the disciple who betrayed Jesus. Now the gospels of Matthew and Mark do not list Jude as one of the twelve apostles but rather Thaddeus. Thus, it had been assumed that Jude's surname is Thaddeus and therefore our patron saint is named, Jude Thaddeus. Other than being listed as one of the twelve apostles, Jude is recorded as being at the last supper, and as praying in the upper room with the other apostles after Jesus' resurrection. 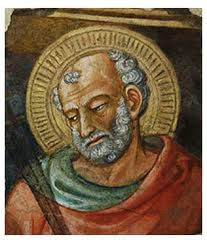 Most biblical scholars would say that St. Jude the apostle is not the same person as the author of the epistle of Jude found in the Christian Scriptures. So, what is known about St. Jude comes from sources outside the bible. It is difficult to determine which written accounts of Jude are accurate and which are legend. Perhaps the most widely held account was recorded by the distinguished church historian, Eusebius, during the forth century. The story goes something like this. King Abgar Ukkama, a brilliant and successful monarch of Mesopotamia was dying from a terrible physical disorder which no human power could heal. Having heard about Jesus' ability to heal, the King sent Jesus a letter, begging for relief from his disease. Jesus promised that he would send one of his disciples to cure the king's disease, and at the same time to bring salvation to him and his people. After Jesus' death and resurrection, Jude Thaddeus was sent to Edessa to heal the King. After examining the king's faith (in the healing power of Jesus), Jude laid his hands on the king and healed him of his infirmities. At daybreak, king Abgar instructed his citizens to assemble and to hear the preaching of the Good News by Jude Thaddeus. It was in this manner that the gospel was spread to that area of Northern Iran. There is a thirteenth century manuscript in Armenia that describes Jude's death. This manuscript records that after having won favor from King Abgar with his miracles in Edessa, the apostle pressed eastward to Armenia to the court of King Sanatrouk, son of Abgar's sister. The apostle "arrived at the king's court to preach the good news of the kingdom of heaven, and there performed miracles and cured all kinds of sicknesses. Many believed his words and were baptized, including the king's daughter. Upon learning of this, king Sanatrouk grew wrathful and sent one of his princes to murder the apostle and his own daughter. Jude was forced to climb up to a ledge raised in the midst of rock. Stretching out his arms in prayer, Jude cried: "my Savior Jesus Christ, do not abandon my diocese, do not leave the people in the errors of idolatry, but illuminate them at the filling moment in the knowledge of your faith." Then the king's men murdered Jude with a sword and buried him in the midst of an overturned rock." Are these events based on fact or fiction? Are the cures and acts of grace bestowed upon people who turn to St. Jude, miracles, or are they coincidences? We will never know the answer. However, this we do know. St. Jude is the symbol and crucible of hope for many Christians. Were it not for hope, the human heart would break. Hope is one of the great theological virtues. It is what keeps us going when darkness obscures the light. Hope is different from wishing. Wishing means to place before one's mind, a desired object or goal and waiting for a favorable outcome. But hope is remembering what God has already done in history and what God has promised to do in the future. Hope is the realization that the love of God has permanently affected humankind and that the whole creation will eventually be lifted up to God. "All things work together for good to them that love God." As the second Christian millennium draws to a close, America is caught up in one of the most fervent religious revivals in its history. We see it in the zeal of the religious right, the passion of the New Age seekers, and the yearning of the hearts of those who are searching for meaning. Our nation has been most blest among nations. Our people have been seen as the best, brightest, richest, prettiest, smartest, and resiliently optimistic. Yet now, we are perhaps the most desperate, a depressed, self satisfied and spiritually empty people. We are now turning our spirits inward to explore the emptiness that no American military or political victory seems able to fill, or that no material gain or scientific milestone can dispel. We found out that a small, poverty stricken country in Southeast Asia could cripple our economic security, and thus have been brought face to face with our own vulnerability. The fitting recourse to this sense of loss of security must be hope, for without hope, desperation waits to fill the void. So how do we increase our hope? When I hear this question, I like to look at a group of exemplar Christians who maintain an incredible sense of hope in the midst of poverty, chaos, corruption, and disease. This group is called the Sisters of Charity, a group of nuns who was founded by Mother Theresa. These sisters are able to pick up rat bitten, infected lepers off the dirty, noisy streets of Calcutta and show these discarded human beings, the love of God. These sisters do not get discouraged. They do not give up. They do not lose hope. Why? What is it that allows them to maintain a non-anxious presence, a presence of hope, in the midst of worldly darkness and despair? A lot of it has to do with their prayer life. Each day, they put aside an hour to practice devotional prayer. It is a simple, innocent approach to religion, where God and the communion of saints are called upon in intercessory and petitionary prayer; where God's saving acts in history are rehearsed over and over again so that they can remember God's faithfulness when there is no apparent evidence in the present moment. Devotional prayer is a means of placing one's mind, and heart, and soul, and hands into God's presence, and allowing the power of the Holy Spirit to permeate one's thoughts, words, and actions. Now many Episcopalians scoff at devotional practices especially when it has to do with praying with and to the saints of our church. Most of us are at a different stage of faith than devotional practice. Our approach tends to be more intellectual. We would rather study the faith than pray it. We would rather be in control than abandon ourselves into the arms or God. However, I do notice that the people of St. Jude's light candles during Sunday worship. I notice that the people of St. Jude's offer prayers of petition each Sunday. Perhaps at a deep level we know that devotion to God and prayer has power to give us a the hope, without which the heart would break. Now what does this mean for us, the people of St. Jude's in Cupertino,whose church bears the name of the Saint of desperate causes? Well there are a lot of desperate people out there who need to experience the light of Christ; who need to be coaxed out of despair and into hope. We need to provide a place where anyone can come and be reminded that God is intimately working in the world, even when there is no evidence in their lives. Now this weekend, your vestry has come up with a vision for St. Jude's in Cupertino. They envision this place to become a spirit-filled church where every Sunday is like Easter Sunday. This means that we are present each Sunday at worship, that the pews are overflowing with joyful and spirit-filled people, raising their voices in song and prayer such that the presence of God can be felt even to the rafters. What an oasis of hope in Santa Clara County we could become! But we have work to do. We need to learn how to pray and to turn to a life of prayer, out of which hope rises up. "It is very important to cross the threshold of hope, and not to stop before it, but to let oneself be led." St. Jude, help us to cross that threshold of hope.